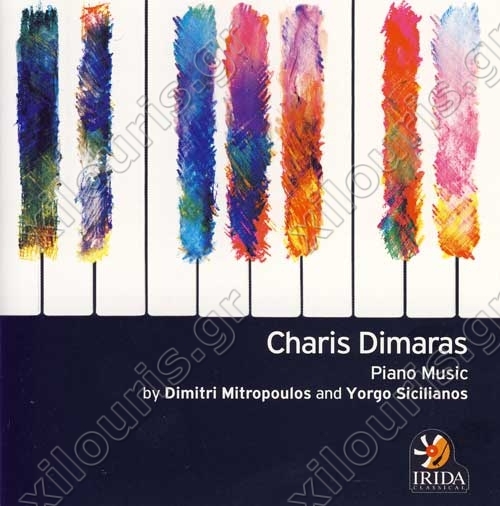 Charis Dimaras - Piano music by Dimitri Mitropoulos and Yorgo Sicilianos was chosen to be released in 2010 to commemorate the fiftieth anniversary of Greek-American conductor Dimitri Mitropoulos� death. The album contains a performance of Mitropoulos� Greek Sonata by acclaimed pianist Charis Dimaras, which is also the first time the sonata is released on CD worldwide. This production was made possible thanks to the generous technical and financial support from the Hellenic University Club of Southern California and the General Secretariat for Greeks Abroad and with the kind assistance of Gennadius Library of the American School of Classical Studies in Athens, where D. Mitropoulos� archives are preserved. Dr. Dimaras chose to perform Mitropoulos� Greek Sonata as well as Eight Children�s Miniatures (Op. 23) by Yorgo Sicilianos as part of his constant efforts to further promote the work of acclaimed Greek composers. conceived: it is a polychrome composition, intense and explosively personal in its style, which only occasionally suggests the world of atonal music, while firmly based both on Greek folk music, as well as on the great romantic tradition. Eight Childrens Miniatures, op. 23, was written in 1963 (a version for orchestra, op. 23a, followed in 1965) for Sicilianos then three-year-old son (to whom it is dedicated) and belong to the middle period of the composers work. At first it was meant for a private audience; later, at the initiative of pianist and close friend of the composer Popi Eustratiadi, it began to be performed publicly and it is now one of Sicilianos most popular and most performed works. At that time, Sicilianos had moved to a second period of musical quest, revolving around contemporary trends in music and had started assimilating elements from serialism (See Concerto for cello and orchestra, op. 22 and Variations on Four Rhythmical Patterns, op. 24, 1963). However, in Miniatures the composer seemed to be leaving aside for a while the problems of composition and its techniques which he was concerned with at that time with the motivation to make a series of childhood scenes associated with the life of his son.